Being pretty self-taught as far as UI design goes, I’ve always wondered why so many articles and books talk about color theory and palettes. In my experience, using a “split complementary palette” is about 0% predictive of me making nice-looking designs. I have another word for that sort of thing: useless. 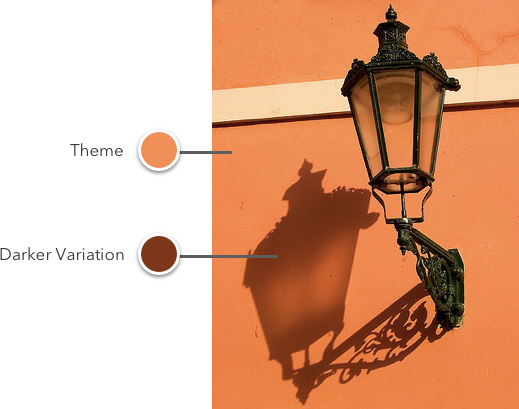 So if color theory doesn’t provide a solid basis for color in UI design, what does? Let me throw an opinion at ya’: color modifications. It’s the tweaking of color that counts, not the picking of them from the color theory hat. Or, said another way: The fundamental skill of coloring interface designs is being able to modify one base color into many different variations. I know this sounds a little odd. Hear me out. I’m going to give you a framework for adjusting color in your UI designs. Are we cool? We’re cool? One thing I’ve noticed across many great-looking interfaces is that they often have darker and lighter variations on a particular theme color. You didn’t think that search bar was just a translucent black overlay, did you? Spoiler alert: it’s not. No opacity of black overlaid on that blue will give you the color of the search bar. It’s a variation picked by some other magic. 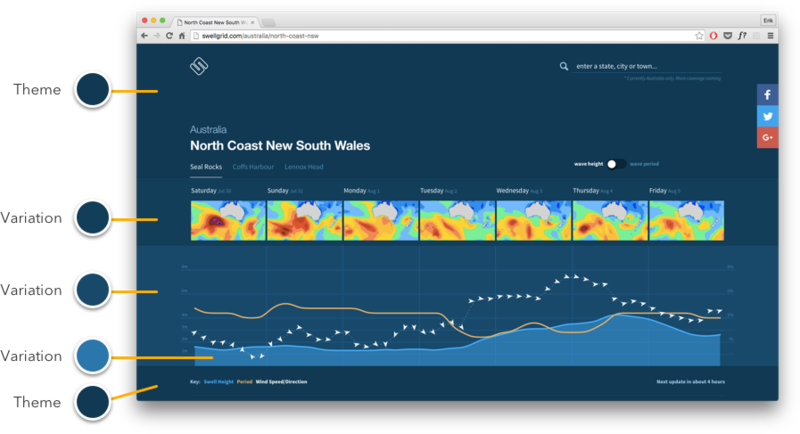 Quick, now look at Swell Grid, the beautiful surf forecast app. Sha-BAM. We just got hit with a boatload of variations. How many are there? Go to the website and count ’em yourself. Practically everything on this page is a variation of the initial blue. Even element states are variations on a color. This isn’t best described as “a palette of 3 blues”. It’s one blue with variations. But this begs the question: how do you actually modify a color to get good variations? We’ll look to the real world for reference cues. Even though our interfaces are “fake”, we still copy like mad from the real world, because after decades of seeing things in the real world, we just expect light and color to work in certain ways. We’ll use the HSB color system. The short of it is: it’s the most intuitive color system with broad usage (for my purposes, Sketch and Photoshop). If you don’t know what hue, saturation, and brightness are, let’s break and meet back in 10. Alright, look around you. What “color variation” are you undoubtedly seeing two dozen instances of every time you glance around your room? You can think of a shadow as a darker variation on a base color. Now let’s jump into Sketch and get our color pickers and figure out exactly what happens when a shadow falls on our coral wall. Like I mentioned, we’ll be figuring this out in HSB. Note: Monitor/image color profiles might make these exact measurements different for you. The brightness moves down — OK, so that was pretty obvious. But hold up – before we go generalizing too much, let’s actually look at another example. 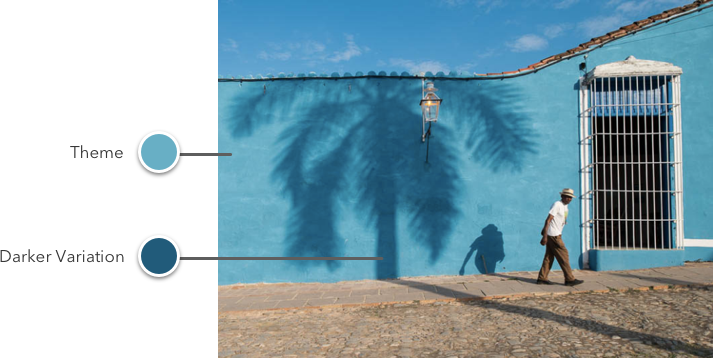 Do shadows work the same way in Cuba? We’re about to find out. Alright, now we can compare and contrast. Notice a pattern? When there’s a shadowed variation of a color, you can expect brightness to go down and saturation to go up. We just looked at this in two instances, but as far as I’ve ever seen, it’s a solid rule you can go by. Now hue is a bit crazier — it went down for the coral wall shadow, and up for the teal wall shadow. There is an explanation for that, but it’s much less important and a bit more esoteric than saturation/brightness — so we’ll come back to hue later. Let’s unpack these concepts a bit more. 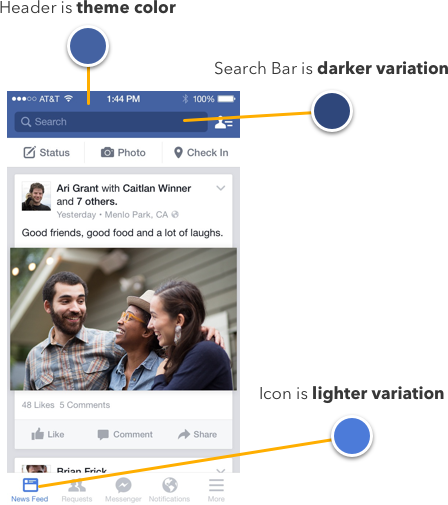 If you look back to our facebook search bar example, you’ll see that’s exactly what’s going on. The hue moves 1° out of 360°, which is practically a rounding error. The saturation went up as the brightness went down. The reason the search bar couldn’t be an opacity of black overlaid on the base blue is because, in HSB, adding black is equivalent to reducing brightness. Instead, we want to reduce brightness while simultaneously adding saturation. Black doesn’t add any saturation to our color! Why, in the real world, are darker colors correlated with higher saturations? I haven’t the slightest idea. But I can always make something up: it’s because as the intensity of the light (brightness) overtakes intensity of color (saturation), the color necessarily becomes more washed out — and vice versa. That might be complete BS, but it kind of makes sense, right? Now, being the discerning and erudite readers that you are, you probably guessed that the opposite transform that gives us darker variations will give us lighter variations. And you nailed it, by golly. Of course, we can go one step further. If we go on lowering saturation and raising brightness till the cows come home, where do we end up? We end up at white. 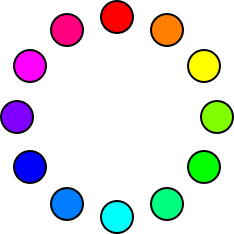 Darker color variations are made by lowering brightness and increasing saturation. Brighter color variations are made by increasing brightness and lowering saturation. With this simple idea, you will be able to do amazing things with just a single color. The truth is, so many variations in color between elements — or even states of the same element — are just simple color modifications. 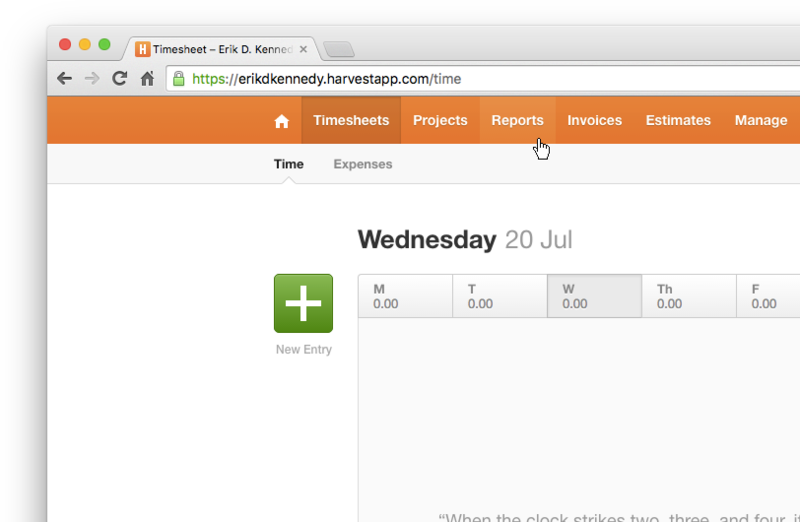 Here’s Harvest, the time-tracking app I use and love. Look at the header. The hover state is lighter. The selected state is darker. Or look at the green New Entry button. The hover state is a darker variation — higher saturation, lower brightness. You will use this again and again. To be fair, not every design follows this rule 100% of the time. In the Harvest header above, the selected state is just a lower brightness (saturation unchanged) and the hover state is just a lower saturation (brightness unchanged). But we’ve looked at how color works in the real world, and we know that why these designs look good is because they approximate the principles laid out here. Speaking of approximating the principles laid out here, we should talk about hue. I said it above too, but it bears repeating: hue is so secondary to the whole saturation-and-brightness-move-in-opposite-directions thing that you can often just ignore it entirely when making color adjustments. That being said, here’s the briefest of explanations. First of all, each color has a sort of “perceived brightness” to it. This is called luminosity. Even though this blue and this yellow are both at 100% HSB brightness, which appears brighter? I mean, like, ask anyone off the street: which is brighter? Thanks, rando. You just discovered luminosity. Yes, yes you are. Even if you hold brightness and saturation constant, and just vary hues, you will get a range of luminosities, or perceived brightnesses, which we measure in values between 0 and 100. These are our hues in 30° intervals, all at 100% saturation and 100% brightness. And here are our hues duplicated, put into Luminosity blend mode (on a white background — that’s critical to add if you’re following along in Sketch), and overlaid with the brightness of the resulting gray. This gives us a measure of the luminosity of the original color. In Luminosity blend mode, a bright gray means high luminosity, and a dark gray means low luminosity. If you think about it for a second, this makes perfect sense. Now, I’ve printed the numbers out for you, but chart’s worth a thousand numbers, right? And this particular pattern answers our question from above. Remember how we saw that sometimes, for a shadow, hue would shift down and sometimes it would shift up? Why does it do that? Well, first, notice that this graph has three maximum points and three minimum points. 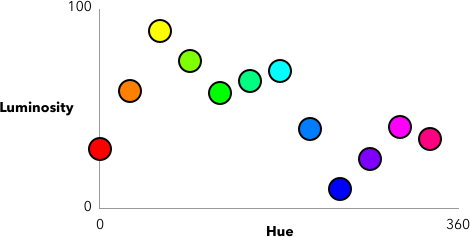 The low-points are red, green, and blue. 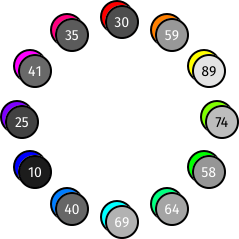 The high-points are cyan, magenta, and yellow. Does these particular colors ring a bell? Yes. RGB and CMY are popular color systems, but ignore that for now, because it’s leading you astray. The important bit is this: if you don’t count saturation and brightness, shifting hue towards red (0°), green (120°), or blue (240°) will decrease the luminosity, or perceived lightness of the color. And shifting the hue towards yellow (60°), cyan (180°), or magenta (300°) will increase the perceived lightness of the color. That’s why the shadow on the coral wall shifted down in hue — it was shifting towards red, at 0°, which is the nearest minimum point to 21°. And that’s why the shadow on the teal wall shifted up in hue — it was shifting towards blue, at 240°, which is the nearest minimum point to 194°. So when it comes to color variations, ask yourself: do I need simply a lighter or darker variation on a color I already have? This will allow you to take one hue, but modify it endlessly for all your UI needs, using darker and lighter variations where appropriate. I just whipped together a quick example here. A whole interface being built out of a single color. Say… does that shade of teal look familiar? How is hue even more important in gradients and data visualization? When you’re in Sketch (etc. ), what technique do you use to make darker variations? Do you to move saturation or brightness more? How do you find grays that match your color scheme? How do you pick totally unrelated colors that look good together? How do you fix it when colors clash? And, of course, just why are RGB and CMY the low/high points on the luminosity graph? 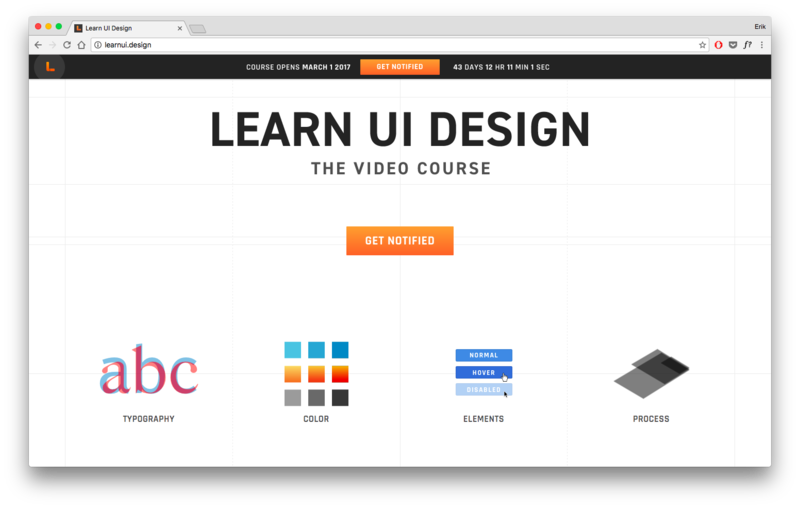 I’ve been working hard the last 11 months to create the single most comprehensive online video course for learning the practical skills of interface design. The course is 16+ hours of video in over 30 video lessons. In almost every video, you’ll watch me design in Sketch. This is important. I’m not teaching some theoretical framework here. 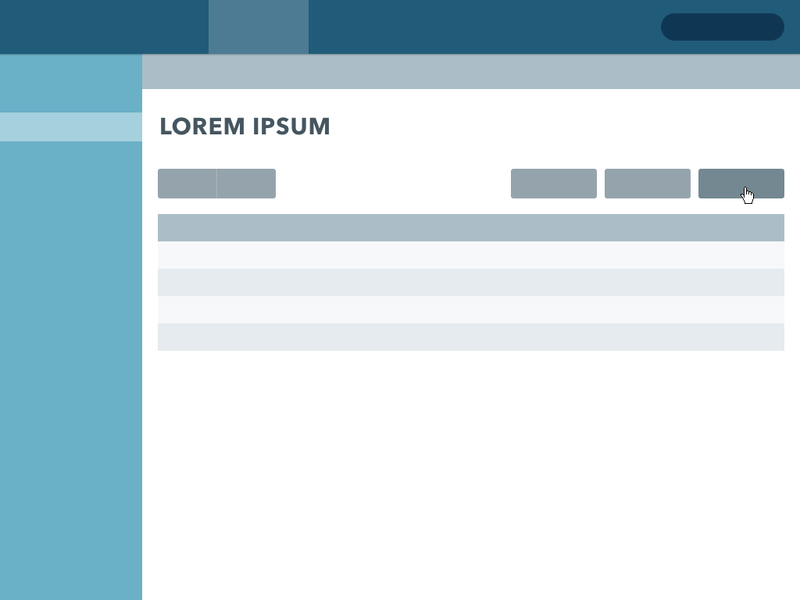 Instead, everything I show you is the tips, tricks, and frameworks I use to design interfaces every day. Think of it as watching over my shoulder as I teach you everything I know. For instance, in the Spacing video (and yes — that’s a 50-minute video entirely on whitespace), I start with a simple text-based example, talking about how to approach letter-spacing, line-spacing, paragraph-spacing, space between the title and the body, space alongside the text, etc. That culminates in me talking about the 3 most important principles of spacing. Then, in the second part of the video, I do a redesign of 350.org’s homepage, specifically focusing on improving their use of whitespace. It builds on all the concepts we’ve just introduced. Finally, I discuss a few cases where you see these rules stretched, like landing pages or data-heavy tables. If you’re a dev, UX designer, or PM, and want to add visual design to your skillset, this course is tailor-made for you. Hop on over to learnui.design for more. And yes, I do have the best domain name ever — thanks for mentioning it. 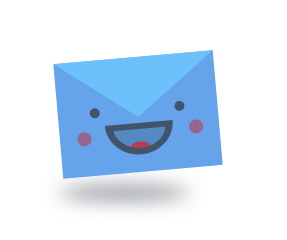 Two final plugs before we say our farewells: I have a Design Newsletter to which I intentionally send out very few but very high-value design articles (like the one above). If you want to see stuff like this every month (or 6) in your inbox (basically all of it unpublished anywhere else), you should take a moment and sign up. Finally: need a freelance UX/UI designer? Hire me.